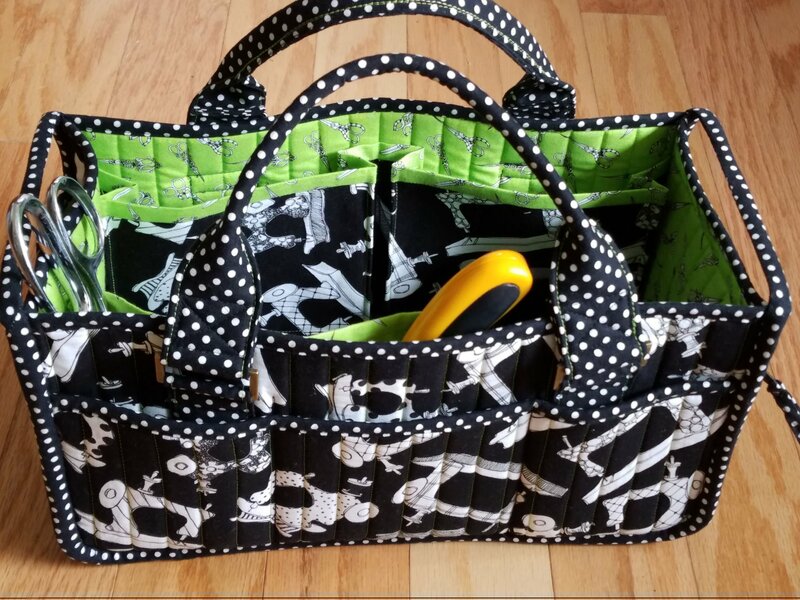 An attractive and convenient caddy/organizer that will accommodate your class sewing supplies, snacks & goodies for a trip, knitting or embroidery supplies, toys for a child, and soooo much more. There are seven slip pockets on the front, back, and end, along with an end zippered pocket. Inside expanding dividers open to organize a multitude of supplies or collapse flat to make lots of room inside. Padded handles make carrying easy and rectangle rings allow them to lay flat along the side. These make wonderful gifts for a special friend, also. Caddy measures 7" H x 13 1/2" W x 6 1/2" D. Come in to the store to see the sample. You'll love it! Note: the sewing machine that you bring to class must be able to sew through several layers of fabric and batting. A light duty machine, like a Singer Featherweight, would not be appropriate for this class. Please bring your lunch or plan to pick something up at a local eatery.